As a certified forklift operator, you have a responsibility to maintain a safe working environment and care properly for the equipment that you use on a daily basis. Not only will being safe and efficient improve your work day, but it will also help the forklift operator working the next shift. 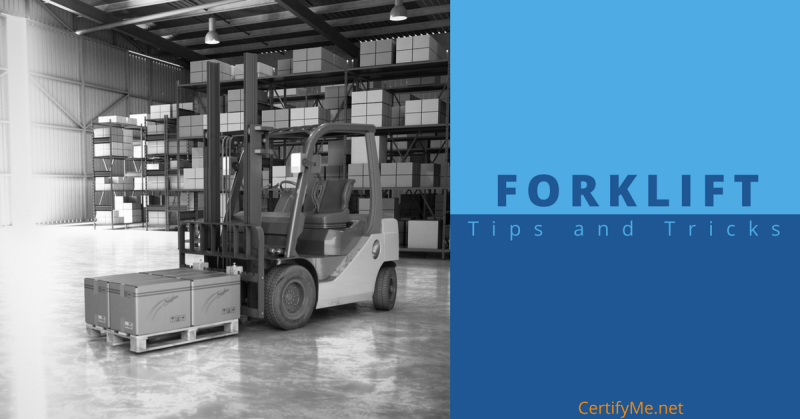 Here are some helpful forklift tips and tricks that will help you be safe and efficient while operating your forklift. Inspect Equipment – Before you start your shift, check the operation of the lift, check tire pressure, check the battery, test steering and brakes, and make sure that the lights and horn are working. Wear the Proper Gear – Besides the essential safety equipment that you should always wear (hard hat, high visibility vest, safety glasses, and safety shoes), it’s important that you are wearing the correct clothing and gear for your job and work site. Loose clothing can get caught on nearby objects or equipment, causing an accident. Know What’s Around You – When you are traveling around your work area, be alert for any potential hazards. This means looking around you, including above your head, when you are moving your load or the forklift. Load Your Forklift Appropriately – Loads should be balanced and below the maximum weight of the lift. When appropriate, make sure that your load is properly secured. Travel at a Safe Speed – Traveling below the speed limit of your work area will ensure that you are able to avoid and stop in time for hazards, people, and accidents. Check Gas and Battery Levels – There are few things that diminish work efficiency like a dead battery or a lift that runs out of gas. Before you start your day, make sure your battery is charged and your forklift is full of fuel. Avoid Excessive Speed – Excessive speed is not only dangerous for your work area, but it also decreases the fuel and battery efficiency of your forklift. Accelerate slow and easy and maintain lower speeds for the best equipment performance. Brake Slowly – Slamming on the brakes of your forklift increases the wear speed of the brakes. To increase the life of forklift brakes, brake slowly and gently, especially when you are fully loaded. Don’t Overload – Overloading your forklift is unsafe and diminishes the performance of your equipment. Follow the load specifications for the equipment that you are using to maintain good fuel efficiency, tire and brake wear, and safety. Avoid Idling – It may seem cumbersome, but don’t allow your lift to idle when you aren’t in it. This also means that you start your forklift just before you start moving. Idling adds hours to the equipment engine and decreases your fuel efficiency.